I would like everyone to know that the REAL reason the rain promised in the forecast for World Beer Fest day in Raleigh didn’t happen was because I WORE A COAT. I find that invariably, when I come prepared for foul weather, it never occurs and I am left dragging around unneeded clothing for the entire day. You may thank me for my sacrifice with gifts of paper currency sent to Banjo at Realbeer.com. I’d rented a GPS unit with my car for the drive out from Wilmington and it made finding the festival and the Moore Square Parking facility very easy so I had loads of time before the event opened to wander the capitol area. With Swine Flu alerts crackling over the airwaves like hurricane warnings I wondered how well attended this year’s World Beer Festival would be. I took my yearly stroll around the capitol grounds, much of which was fenced off and dug up this year, and I noticed something that hadn’t penetrated my brain before, the Capitol building is ringed by churches. “Lawd yes,” we Southerners love our Sunday sermons, but this hit home with me as a true testament to how little separation there actually was/is between church and state in Tar Heel culture. This realization was underlined by my inability to bring up a beer website on the free wifi at Charlotte, NC airport on the way in due to content restrictions. As the lines began to form for the fest in Moore Square I continued my walk around town, and guess what I found…a block party! But not your regular type of block party, noooooo, this is North Carolina after all. It was a Big Ol Christian block party, right there next to the States Biggest Beer Bash! There were Christian rockers, rappers, and gospel singers. The air was filled with the intoxicating smells of hotdogs, chicken and Pork BBQ and, as most North Carolinians are, they were a warm happy crowd of the nicest people you’d ever want to meet. After a couple shots at the poor guy in the dunk booth, (it was for a good cause) some good gospel, and a half a BBQ chicken, I was primed to meet the Beers of the World. 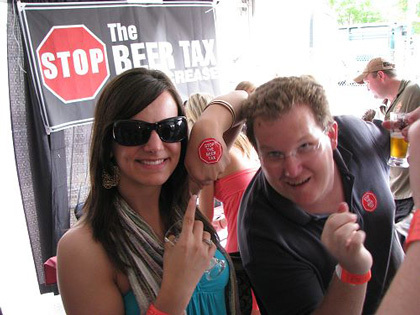 By now the line was long and noisy with hundreds of gleeful beer enthusiasts. Beer t-shirts and pretzel necklaces were the uniform of the day and everyone was dressed for a hot humid day of beer drinking. 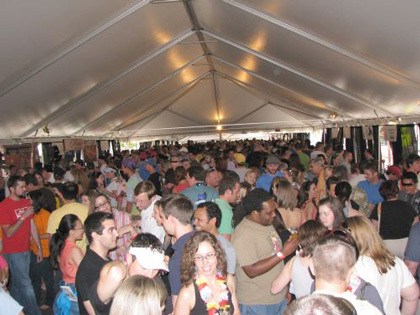 The demographics of most beer festivals I go to are heavily slanted towards the male of the species, but not here at Raleigh WBF, where I think it was at least 50/50 if not a little more female than male in mix. 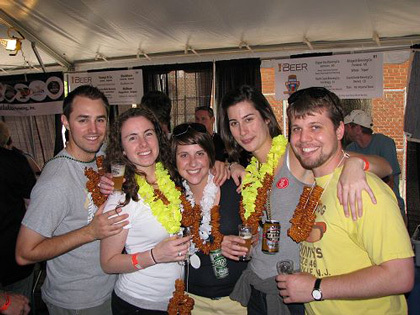 WBF volunteers moved down the line passing out the Festival Beer Guides and checking IDs. 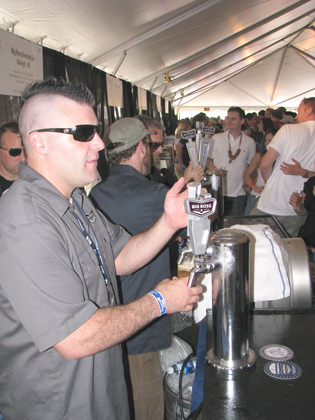 The All About Beer team’s entry process runs like a well oiled machine so once attendee’s hit the gate, it’s a quick and easy process for ticket scanning and getting your tasting glass. Like the others waiting in line, I’d had a chance to peruse the list of the fest’s delicious craft brew and place a check next to those I absolutely had to try or in some cases retry. This done I referred to the map in the center, and made my plan of attack. Laugh if you like, but those tents fill to bursting with a sea of humanity within minutes so it’s important to know where you are going and what you’re seeking. Without a plan you’ll just end up moving from table to table drinking great beer indiscriminately and who wants that? Okay, I’ll admit it. I always start off with a plan, but I’m easily distracted. Who can pass up a chance to enjoy great beers like Magic Hat’s Wacko, Great Divide’s Yeti Imperial Stout, or Rogue Ale’s I2PA? Not me. Since my plan was going to hell I tried resorting to the Beer Flight list. The list breaks beers down into fun categories’ like; Tar Heel Beer, Not Afraid of the Dark, Culture Clash, Belgian & Belgian Style Brews, You Put What in my Beer?, & The Hop Heads Delight. I chose “Not Afraid of the Dark”, but that didn’t work for me either, what I ended up with was a lot of indecipherable notes on more beers than I care to admit I tried that day. Here are some highlights. Aviator Brewing’s HogWild IPA was being pulled through a hop infuser filled with fresh hops, giving a beer that is already very good an excellent fresh hop tang. Great Lakes Edmund Fitzgerald Porter – This beer has been winning awards since 1991 and still stands as one of the best American Porters I’ve had. Lost Abbey Carnevale – The blonde saison with a mild west coast hop bite is a new seasonal release from this 3 year old California Brewery, brewed to mark the Lenten Season before Easter. My notes described it with one word…beautiful. Dogfish Head Palo Santo Marron – Is there anything Sam Calagione makes that doesn’t have a story behind it? If so I’d like to know what it is. This 12% abv beer is described as “unfiltered, unfettered, unprecedented brown ale aged in handmade wooden brewing vessels. The caramel and vanilla complexity unique to this beer comes from the exotic Paraguayan Palo Santo wood from which these tanks were crafted. Palo Santo means “holy tree” and its wood has been used in South American wine-making communities.” What you should also know is Sam imported enough of the Paraguayan Palo Santo wood to build his own 10,000 gallon tank. Like many of Sam’s beers the story alone makes you want to try the beer and like all of the Dogfish Head beers I’ve had, it’s excellent. Mendocino Spring Bock- First introduced last spring, this offering from one of California’s Pioneer Craft Breweries was a wonderful break from heavy beers. Rich Malty flavor with a slight floral nose, very light and enjoyable. It’s hard to believe it’s 7% abv, you can’t taste it at all. 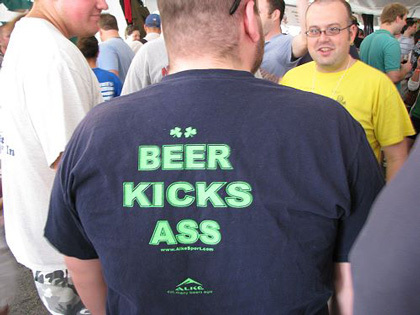 Of course, there’s more to the World Beer Fest than beer. 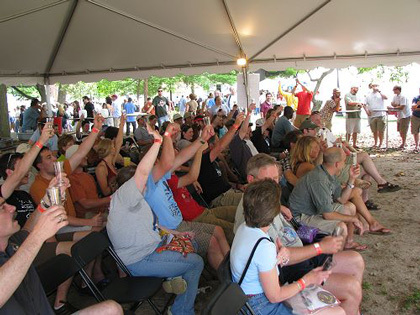 There was music, vendors, and sessions covering basic beer 101, the Triangles new brewers, Beer & Chocolate, and more. I finished my day working my way through a huge plate of fresh fried potato chips while listening to a Southern Reggie Rock band called “Guta”. .
Raleigh is my favorite WBF venue; it really is a class event, and the best way to kick off the beer fest season. Congratulations to my friends at All About Beer Magazine and the hundreds of volunteers that work so hard to pull together the elements that make this such a fine festival, job well-done. More event pictures can be found on Flickr. 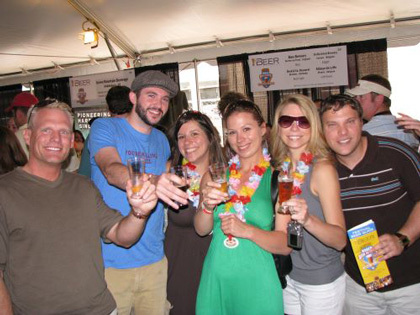 More information about the next World Beer Festival can be found at All About Beer.